Dear Guests: THE 5-STAR REVIEWS say it all. 'House by the Sea' is a rare 1915 oceanfront home with incomparable Hawaii-like views, a sugar-sand beach, beach stairs from our land, and has been carefully and captivatingly renovated in a yesteryear-charm neighborhood of vintage homes and verdant lawns and gardens. With a Sub Zero refrigerator, 6-burner 4-oven English Aga cooker, and central air conditioning, this home is idyllic, comfortable, and ideal for unforgettable family vacations. Big screened oceanfront dining porch for your fresh seafood dinners, nap to the sounds of the surf, check email w Wi-Fi on the lawn, s'mores at the fire pit overlooking the ocean, with colorful Adirondack chairs circling the fire. This amazing house has 5 bedrooms (all with ocean views) 3 bathrooms. House by the Sea is decorated in restrained Nantucket style. Its oceanfront living room has fireplace, wainscotting, beams, paintings, and books. The living room opens to the beamed dining room with ocean views and charming Oceanview bay window seats. Wine/coffee pantry has wine glasses, Keurig coffee maker +automatic drip (Mr Coffee)+ French Press, stainless-steel 2-drawer drinks refrigerator. The well-equipped kitchen has the iconic Aga cooker (4 ovens, 6 burners, custom paneled exhaust hood), 36" stainless steel Sub Zero refrigerator, and honed granite countertops. Ample quality cookware, dishes, flatware, small appliances, glassware, table linens, kitchen linens, spices, condiments, paper goods, and laundry supplies. Adirondack chairs line up on the lawn or around a fire pit, where you can watch a sunrise over coffee or catch a glimpse of the big dipper on a mild summer night. (Starter supply of firewood provided.) You would think that all East Coast oceanfront homes have dramatic moon rises and sun rises, but not so… you have to be in the right spot, facing the right way, to get these glorious spectacles of nature. Is this the right spot? YES, it most certainly is. There is a crushed stone patio with a gas grill and teak English patio benches umbrella and chairs. There is something special about seeing the ocean surf, bluffs, and beach through 100-year-old wavy glass. You'll enjoy three private couples bedrooms 1) a queen, 2) another queen, 3) a king made of 2 singles, since we can't get a real king up the stairs.) 4) A "loft" full-bed bedroom on the same floor, with ocean view, railing on one side, and 5) bunk room w two bunk beds+ a single bed so the room sleeps 5 kids, or an adult and 4 kids, or all adults flexible enough to sleep in bunk beds. The first-floor full shower-bathroom has a step-up (it's an antique house) and contains a 4-foot shower plus the laundry stacking washer dryer. The second floor has two bathrooms. One has a subway tile shower with octagon tile floor and replica antique plumbing with Antique-style exposed thermostatic valve. The other bathroom, newly renovated, has a shower, and pedestal sink. From the vantage of House by the Sea, the arc of beach and bluff looks like a scene from Hawaii. There are 100 steps down to the beach, two landings with catch-your-breath built-in benches. On July 3, with magnificent fireworks rising from the beach, this is possibly the most spectacular place to be within 2,000 miles. old, un-renovated, spectacularly situated on an ocean bluff above a beautiful, white-sand beach, it seemed this house was always 'for sale.' The Jackie-O-beautiful elderly owner kept a permanent sign on the old garage with a (hand) painted price asking triple the current market. It was way beyond my means as a young graphic designer and illustrator. Years went by with that for-sale sign on the garage... but now our petite titan wanted twice that. Knowing I could never afford it, I suggested to her (now on speaking terms) how this lovely elderly lady might wrangle some tax advantage by moving in full time, staying, and saving her large gain. Never did I imagine I could figure out how to own this house at her astronomical price. But the Boston RE market was surging; we sold our JP condo, cashed in my Keogh plan+IRA, and bought it in its shockingly rough, unheated, uninsulated state, with homosote dropped-ceilings hiding the gorgeous original 1914 framing. Every year has seen a big transfusion of green, lovingly upgrading this incredible, authentic Cape Cod "cottage" in a way that maintains its old charm. (in Newport, they call mansions "cottages.") Year after year, better and better. Three years ago, the great old house got her 36" Sub Zero TCI, two-years ago two new 15-light custom-insulated Andersen French doors, and last year renovated third bathroom and a top-to-bottom, hugely-costly, beautifully accomplished paint job. We are grateful for the families who have come back every year supporting our transformation effort while we give 150% to support their vacation visions. We want to surprise them by making it just a bit more magnificent each year they return. This incredible 1915 oceanfront 'mega-cottage' was one of the first few built on these famously beautiful bluffs. If you see the antique postcards, this was an almost uninhabited coastline. And back then, you could choose the best spot. Nobody else was around. As a few homes were built over the decades. They were 'of the time' vintage New England style and are now part of this charming, casual-upscale walking neighborhood with lawns and gardens, children on bikes, the occasional couple strolling the quiet oceanfront roads with a four-legged best friend. And it's not just for summer anymore--now you can come for cool weather ocean winter beach walks, cozy by the fire when you return, toddy or tea with your English pudding in the Aga. Not only are summers a dream-come-true, but now fall and early winter can be the best months of the year. White sugar-sand beach, Hawaii-like views, authentic 1910 architecture, incomparable spot, beach stairs, broad lawn, precious neighborhood with lots of amenities -- just an amazing, wonderful place to be any time of year. Upstairs bathrooms retain their vintage charm: wood floors, an antique tub, replica plumbing, beamed ceilings, bead board walls. Downstairs bathroom has modern acrylic shower, grohe shower valve, modern front loading washer dryer stack pack laundry. We are DIRECT OCEANFRONT W STAIRS TO BEACH, across the road are homes that claim they are oceanfront, but are not. Imagine it is 1908. You can build on any spot on the seacoast . Naturally, you will choose the best spot -- because there is no other house around. This is the spot, the view, the curve of the coast, the rising of the moon over ocean in front of you, the rising of sun like a glowing red cherry out of the ocean... this is the spot you choose. Central air, but when it's 95 outside, the central air can often only cool the house to 78 degrees. Thankfully, that is only a few days each summer. Top quality bedding, ample beach towels, fresh white towels, navy towels, wash cloths, hand towels, kitchen dish towels, quilts to cover sofa if needed. Compact stacking washer dryer in first floor bathroom. Handles normal sized loads. Be sure to align the prongs of the porthole door with the prong-holes of the machine when closing door. Compact stacking washer dryer in first floor bathroom. Handles normal sized loads. Un-parkable 100 year old garage acts as a pavilion to store beach chairs and umbrellas and hammocks. Street-side space in front of garage is reserved for owner and help. Tea, coffee filters, SPICES, condiments, usually there's sugar, flour, baking powder, straws, handi-wrap, aluminum foil, baggies, trash bags, laundry soap and bleach, bar soap, Miele vac filter bags. An abundant array of cooking and dining provisions, lots of white dishes and serving bowls, ample good glassware, flatware and serving utensils. Special requests? We can almost certainly help. FiOS supplied by Verizon. Usually the service is very dependable. Verizon is responsible should an outage occur. You'll want to bring your own music. Broad expanse of lawn, fire pit, and lots of colorful Adirondack chairs to position where you'd like to see the awesome view. Exquisite house with gracious outdoor spaces and stunning views. The "House by the Sea" has everything you could want for a wonderful couple's or family escape. I can't describe it any better than owner Robin has in her description. She says it all! It's exactly as shown in the pictures, well maintained and squeaky clean, with comfortable and charming spaces throughout. Booking at the last minute, Robin was incredibly responsive and accommodating and prepared the house with fresh flowers and lights on for our evening arrival. My family of five spent a glorious week on the expansive porch overlooking the bay, playing games and having dinners on the screened porch, reading by the warmth of the gas fireplace, hanging out on the sandy beach, and sleeping soundly with the ocean breeze and the sound of the waves. The baths are charming, the showers strong and hot, towels and amenities plentiful. The kitchen is well supplied with quality cookware and just about any appliance an experienced cook might need. Natural light is abundant from many oversized windows. The outside was a perfect space for our small dog and for lounging; our only regret is not using the fire pit as the days were cool. The neighborhood is quiet and feels private, but so close to everything you might need. You will not be disappointed by anything with the House by the Sea; it honestly couldn't be nicer! The photographs on VRBO only hint at the charms of this well cared for historic home set on a secluded bluff overlooking Cape Cod Bay. Yes –as the pictures show- the views are nothing short of spectacular. And even better in person; particularly when sipping gin and tonics on the rocking chair porch and feeling as though there is no one else around for miles. But what sets this property apart is the artistry and attention to detail with which this sparkling clean and comfortable home is furnished and maintained. The amateur cook will delight to discover an unusually well equipped kitchen complete with excellent cooking knives, Subzero refrigerator drawers, an AGA gas range, food processor, two outdoor grills (one charcoal, the other gas with extra tank supplied), a complete set of steak knives, and more pots, pans, plates, wine glasses, muffin tins, soup crocks, mugs, bowls, high quality cloth placemats and napkins than the discerning guest could ever want. We spent two restorative weeks at this special property during an unusually hot August and were grateful for the air-conditioning. We delighted in the private beach, which was uncrowded even at the height of the season. We also loved the outdoor shower (not even mentioned on VRBO) and the gas fireplace in the living room perfect for blustery nights as well as the beautiful formal dining room with wrap around boat deck views as glorious as the porch. Robin and John could not be more responsive nor generous landlords. One hates to praise too much for fear that this wonderful place of privacy and privilege will be snapped up before we have the chance to reserve again. This is truly a special place. My wife and I stayed in "House by the Sea" for a week during our summer vacation celebrating her birthday. Not only was the house very charming and well maintained. It also offered EVERYTHING you could possibly need for a vacation at the sea. Whether it was all the tools in the kitchen for preparing the dinner or the two barbecue grills outside. The numerous rocking chairs on the porch or the fireplace on the front lawn. And if there was a question or small issue arising - Robin and John where lightning quick to answer or resolve it for us. A perfect stay ! Perfect house, clean and big enough for our group! Quiet beach! Everything is on hand for a great stay! The view from the front porch of this home is perfection! Time easily slips away as you sit in one of the many rocking chairs and gaze at the view. The house is well equipped with everything you may need for a perfect stay. Robin and Jon are the best! We look forward to visiting again! 60th birthday with family, a perfect week in paradise. House by the Sea is located on a verdant stretch of coastline with awesome views and a sugar-sand beach about 50 miles south of Boston, 10 miles north of Sandwich/Cape Cod, and 8 miles south of Plymouth Rock in downtown Plymouth. Logan Airport and Providence's TF Green airport are about equally convenient. Day trips to the Cape and Islands: A quick 15 minutes to the Sagamore Bridge, and from there 20 minutes to the ferry to Martha's Vineyard in Falmouth. The hamlet of Manomet is an old summering area with many old shingle style homes, cottages, all spread nicely apart with lovely lawns and tended gardens. The neighborhood is serene and there are unpaved roads along the ocean up to the Manomet Center for Conservation, (long known as the Manomet Bird Observatory) for long walks with beautiful waterfront scenery. The town includes a good wine shop, small eateries, a library, CVS, a Stop N Shop, salon, pizzeria, banks. At Manomet Point: the Lobster Pound (a destination in itself) for crab cakes, lobster, oysters, and exquisite fish. There are three bathrooms; two have modern showers, one has a footed tub updated with high-tech, vintage looking, pressure balanced/up-to-code scald protector shower valves. A hammock invites you to check out how your toes look with nothing but ocean-blue behind them. 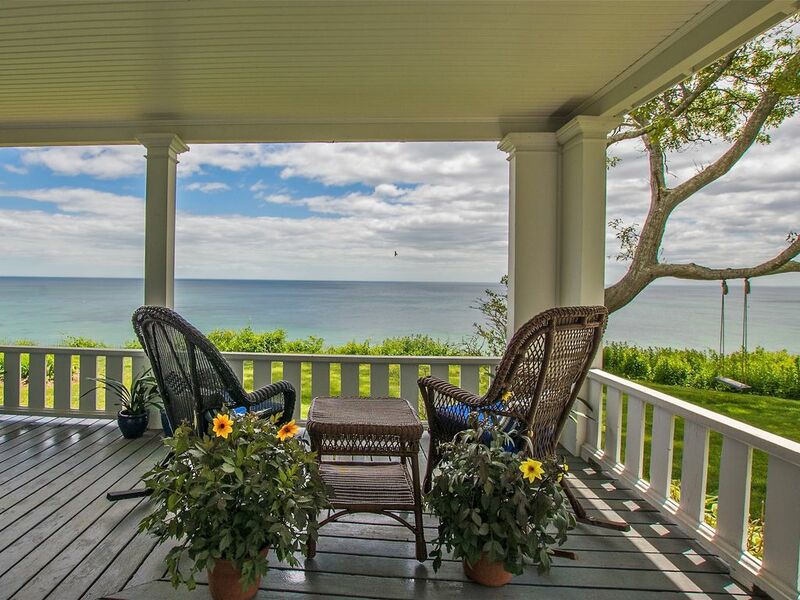 From lawn, porch, and house, you have 180-degree ocean views in an awesome coastal setting. (One person told us it looks like Hawaii.) Sturdy steps (but lots of them, 110 to be exact) descend to a private beach where white sand offers a soft landing. When the tide goes out, pristine sandbars appear, with little tide pools for even the youngest waders and hunters of sea stars (starfish), sand dollars, and the amusing, tiny hermit crabs. You can walk to the Manomet Library or the nicely provisioned wine shop (which looked nicer when it was an old 1920s gambrell home but wasn't quite as popular.) Stroll a little farther to the local grocery store. A two-mile car (or bike) ride arrives at the picturesque Lobster Pound way out on Manomet Point, with surf lapping two sides. Lobsters can be steamed to order (less mess than cooking at home) and they sell delicious reinvented gourmet crab cakes (more eggy than bread-y, a real treat) along with clam chowder and lobster bisque. Helps keep you out of the kitchen and in your chaise.